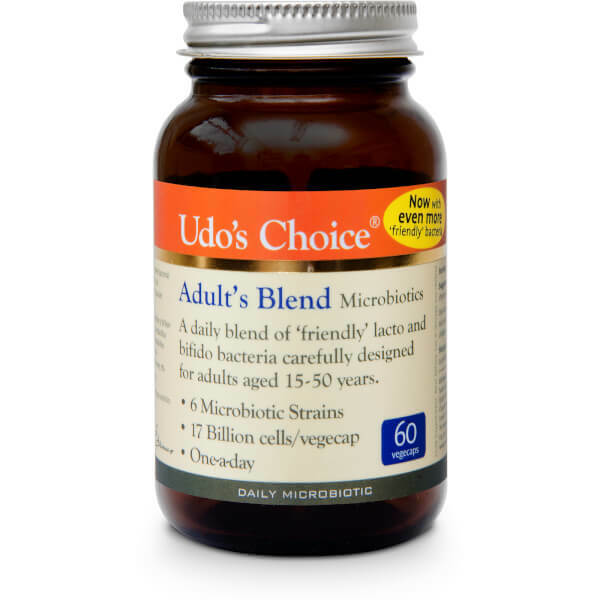 Udo's Choice Adult's Blend Microbiotics provide an easy-to-consume daily blend of ‘friendly’ bacteria to support the immune system functionality and encourage proper digestion. Microbiotics are the beneficial lacto and bifido bacteria that occur throughout the digestive tract and are essential in replenishing healthy gut flora, which helps to reduce gas, bloating and constipation. • 17 billion cells per capsule, including: Lactobacillus casei (HA-108) : 35%, Lactobacillus rhamnosus (HA-111) : 25%, Lactobacillus acidophilus (HA-122) : 20%, Lactobacillus plantarum (HA-119) : 10%, Bifidobacterium bifidum (HA-132) : 5%, Bifidobacterium breve (HA-129) : 5%.